*Quick tip before starting any presentation on your iPad: Always make sure to disable notifications. You don’t want unexpected pop-ups and alarms going off in the middle of your presentation! If in a group presentation, don’t be afraid to use a projector and an iPad. In using both, you can control the presentation from your iPad and have the option to pass it around for a personal touch. Yet, if you do bring this dual attack, we suggest not relying on a native wifi connection or equipment. We’ve known too many great presentations to be ruined by inadequate hardware or inconsistent connections. • An Airport Express creates a private wifi network. This helps you avoid being dependent on a weak, or in some cases non-existent, wifi connection. • The Apple TV wirelessly connects you to a projector using a your private wifi network. Play to the iPad’s interactive strength by using real-time apps in a presentation. Every iPad owner is familiar with Keynote, but here are some other apps to spice things up. • Prezi Viewer is a way to create interactive presentations with everyday Keynote content. • Power Presenter allows you to draw, highlight, and email a slide within the presentation. • Saduns Whiteboard gives you an alternative to a slide deck, offering an interactive digital whiteboard for presentations. This may sound like an obvious word of advice for any presenter, but rehearsing is even more relevant to iPad presentations. Why? First, presenting with materials demands a different rhythm than pitching without materials. Second, there is often a discrepancy between what that presentation looks like when creating it and what it looks like on an iPad. Make sure to run through the audience’s experience by watching your own presentation. In the end, nobody wants to be that person who creates a Keynote with a font that the iPad doesn’t support. Rehearse! Even if you choose not to use interactive apps, embedding widgets into your slides can add a dynamic nature to any presentation. Go beyond static keynote or powerpoint decks by combining documents, web pages, videos…etc. • Vimeo or Youtube. Simply clicking a play button to divert you from a slide show and open a full-screen video is a perfect way to keep attention. • Office365 software can be embedded. This comes in handy when dealing with complex spreadsheets that don’t fit within a slide. 6. Keep content simple and images large. This is classic slide-show-building advice that becomes even more important when pitching on an iPad. When on an iPad without a projector, the size of screen can be limiting. Here’s a great example of a presentation with simple content and large images: Everest Investors Deck. 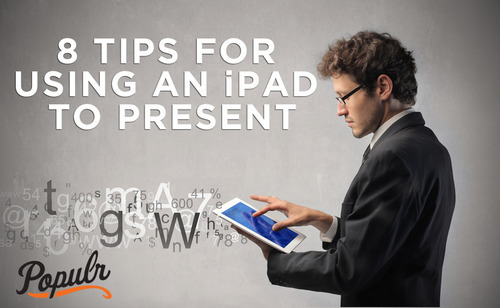 Now that you’ve impressed them with your iPad presentation, don’t simply tell an audience you’re going to send a followup email. Show them your follow-up materials with FAQ’s and additional assets at the end of your presentation. This will make them more comfortable with the materials, the layout, etc when they receive it. • Populr.me offers you the chance to publish all follow-up links, assets, files, etc on a one page website and email in one click. Strike at the moment of inspiration. If there’s any level of commitment you’re asking for during your presentation, pass the iPad for signatures after the pitch. Just remember. Anyone can pull out an iPad and flash it around for a presentation. However, there’s a difference between using an iPad to present and intelligently using an iPad to present. They both make a presenter look great. But the latter plays to the iPad’s strengths, setting a presentation apart and exerting every possible method to connect an audience with a message.